Last week I showed off part of my plan to add desert giants from Tome of Beasts into the latest (and in my opinion greatest) fifth edition Dungeons and Dragons adventure, Storm King’s Thunder. I introduced you to the giant lord Emir Ayla Zeif and told you all about her plan to murder other giants and gather their skulls for a ritual that could free a Jotun giant from its pyramid prison. Desert giants were added to chapters 1 – 4 of Storm King’s Thunder. This week I’m going to begin adding my own chapter to the book. This chapter would fall somewhere between chapters 5 and 9. Let’s call it Chapter 8.5: Pyramid of Desert Giants. This chapter shows off Zeif’s lair, Dorsnarg Pyramid. 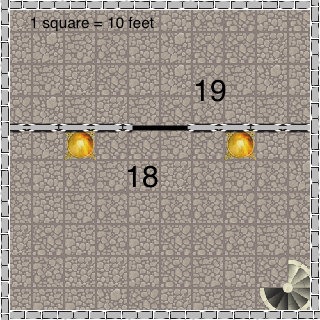 First up, some maps I made using Pyromancer’s Dungeon Painter. Next week we’ll talk about what exactly happens inside this pyramid, but for now, let’s cover the introductory materials of the chapter. In this chapter the characters have an opportunity stop Emir Ayla Zeif before she releases Erlin the Great, an enraged Jotun giant, from his prison. If the characters obtain Zeif’s conch of teleportation, they can use it to teleport to Maelstrom, King Hekaton’s undersea citadel (see chapter 10, “Hold of the Storm Giants”). Obtaining the conch is their main goal here but the characters may take action to free or leave Erlin imprisoned. If characters may choose to let the Jotun out, he is ready for vengeance, but clever adventurers can direct this rage and use it to their benefit. Before running this part of the adventure, review the information on desert and Jotun giants in the Tome of Beasts. It will help you roleplay the giants in this chapter. Ayla Zeif has become obsessed with opening Erlin the Great’s prison ever since she deciphered a hidden meaning in the runes all desert giant inscribe onto their skins. Those inscriptions led her to Dorsnarg Pyramid where the Jotun is imprisoned and also contained instructions for a ritual that would unseal Erlin’s cell. Once the Jotun is free, Ayla hopes to use Erlin’s knowledge and strength to rise to the top of the ordning. She knows he once fought against the gods. During that war Erlin and his kind may have succeeded had not the rest of giants aided the cause of the gods and imprisoned the Jotun in places like Dorsnarg Pyramid. The emir believes freeing such a powerful being would make even the All-Father himself quake with fear and force the gods to crown her queen of all giants. Since the hunt for giant skulls to power the unsealing ritual began, Ayla has focused on nothing else. Her husband and second-in-command, Calamed, runs the day-to-day operations of the pyramid. He keeps the rest of the desert giants fed, sheltered, and hunting for skulls. Ayla’s neglect has spurred Calamed into an affair with another giant, Mira Burma. What started as a fling has become true love. Calamed wishes to return to the desert giants old way of life as nomads, but he cannot openly challenge his wife or leave her without facing death. When the characters arrive at Dorsnarg Pyramid, Ayla has all fifty skulls she needs to perform the unsealing ritual. Desert giants under Ayla’s command captured Farragut, a copper dragon known as the Scribe of the Desert. The dragon’s hobby is collecting pieces of lore with a particular interest in giant culture and history. She has Farragut studying the skin of long dead elder desert giants to decipher the unsealing ritual. Farragut works quickly and unhappily at his task, hoping Ayla’s promise of freedom isn’t a lie. In truth she plans to give the dragon to Erlin as a gift in which case the dragon’s fate would be short and bloody since the Jotun hates dragons. Erlin the Great has been sealed in his prison for thousands of years. The magic of Dorsnarg Pyramid sustains the giant. He has no need for food, water, or air. Years of imprisonment have left the giant boiling with rage. Hatred keeps Erlin focused and sharp. Every minute of every day he curses the giants and gods who put him in the pyramid, sure that one day he will have his vengeance. Dosnarg Pyramid was buried by the sands long ago and only recently uncovered by desert giant excavators. The huge pyramid has a large ground level and smaller top level that holds Erlin’s actual prison connected by a hidden staircase. The pyramid’s main entrance is hidden. A false entrance contains traps and a mummified desert giant guardian. Once inside the actual pyramid the characters will have to contend with desert giants, their scorpion pets, and a host of traps and guardians left active within that don’t bother the giants. 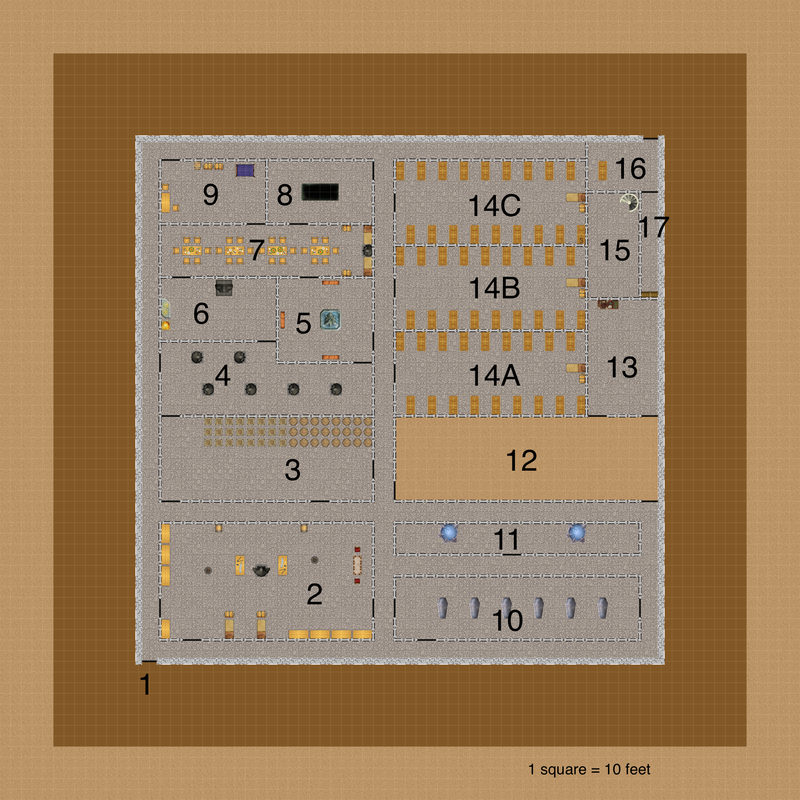 See the “Dorsnarg Pyramid: General Features” sidebar for more information on the pyramid. The following features are common throughout the pyramid. Ceilings. Unless otherwise noted, interior chambers have 30-foot-high ceilings, with 20-foot-high passages and doorways connecting them. Doors. Each of Dorsnarg Pyramid’s doors is 20 feet high and made of stone. Unless otherwise noted, the door is unlocked. Door handles are 10 feet above the floor. A Huge giant has no trouble opening a door. A smaller creature can attempt to open a door, provided that creature or some other helpful creature can reach the door’s handle and unlatch it. While the handle is unlatched, a creature must use an action to push or pull on the heavy door, opening it with a successful DC 16 Strength (Athletics) check. On a failed check, the door doesn’t open. Illumination. All areas of the pyramid are brightly lit by magical stig runes that glow yellow on the walls. If one of these runes is carved out of the wall it no longer sheds light. Oversized Furnishings and Objects. Most of the furnishings and other items in Dorsnarg Pyramid are sized for desert giants. Exceptions are noted in the text. Tables, benches, and other room fixtures are typically twice as high, long, and wide as their human-sized equivalents and roughly eight times the weight. Small and Medium creatures can scuttle under and clamber over giant-sized furniture, treating the spaces the furniture occupies as difficult terrain. The characters can travel to Dorsnarg Pyramid on foot or horseback. If the characters have an airship (see the “Airship of a Cult” section in chapter 4), they can land it pretty much anywhere outside the pyramid. The desert giant keeping watch outside the main door (see “Approaching the Pyramid”) spots the airship if it approaches within 1 mile of the stronghold and runs inside, putting the entire pyramid on alert (see “Denizens”). If the characters use the airship’s weaponry to attack Dorsnarg Pyramid, the defenders are smart enough to remain inside its impenetrable walls. The characters might instead approach on a flying mount. They can obtain griffon mounts in Fireshear or hippogriff mounts in Hawk’s Nest. Neither settlement is close to Dorsnarg Pyramid, requiring the characters and their mounts to rest between flights. Characters mounted on hippogriffs can travel 54 miles per day (three 3-hour flights with 1-hour rests in between). Those mounted on griffons can travel 72 miles in the same amount of time. The desert giant keeping watch outside the main door (see “Approaching the Pyramid”) spot flying mounts that approach within a quarter mile of the stronghold and runs inside, putting the entire den on alert (see “Denizens”). Adventurers can approach Dorsnarg Pyramid from any direction. Those who come near the pyramid without taking efforts to conceal themselves are spotted by the desert giant in waiting in the sand (area 1), who quietly slips inside the hidden main door and alerts the guards in the complex. Characters stand a better chance of infiltrating the pyramid if they approach cautiously, taking advantage of the terrain and using darkness, fog, camouflage, or magic to conceal their movement. Regardless of how the characters approach the den, have them make a group Dexterity (Stealth) check contested by the desert giant’s Wisdom (Perception) check. The giant should make the check with disadvantage as it is buried in the sand. If the characters take precautions, give them advantage on their checks. If they take none, impose disadvantage on their checks. The characters may not notice the main door to the pyramid (see area 1). If they cannot detect the door, but remain hidden and watch the pyramid, eventually the guard from area 14C comes out and relieves the guard here. This allows the characters to witness the main entrance being used. The Dorsnarg Pyramid Roster table summarizes the locations of the pyramid’s inhabitants and indicates how those creatures react when intruders are detected. As soon as trespassers are spotted or combat erupts, the entire lower level of the pyramid goes on alert. As a consequence, adventurers might find themselves fighting several encounters’ worth of creatures at once. 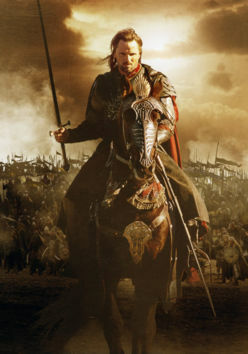 If Ayla Zeif dies, her husband takes over and leads the giants into the desert to be nomads once again. If Ayla and Calamed both die, the morale of Dorsnarg Pyramid’s other desert giants breaks, and they flee into the desert with their giant scorpion pets. The other guardians of the pyramid remain. 1 1 female desert giant Tome of Beasts The giant is hidden in the sand. 2 2 male desert giants Tome of Beasts The desert giants stay here to defend the skulls. 3 4 giant scorpions Monster Manual The giant scorpions stay here to guard the supplies. 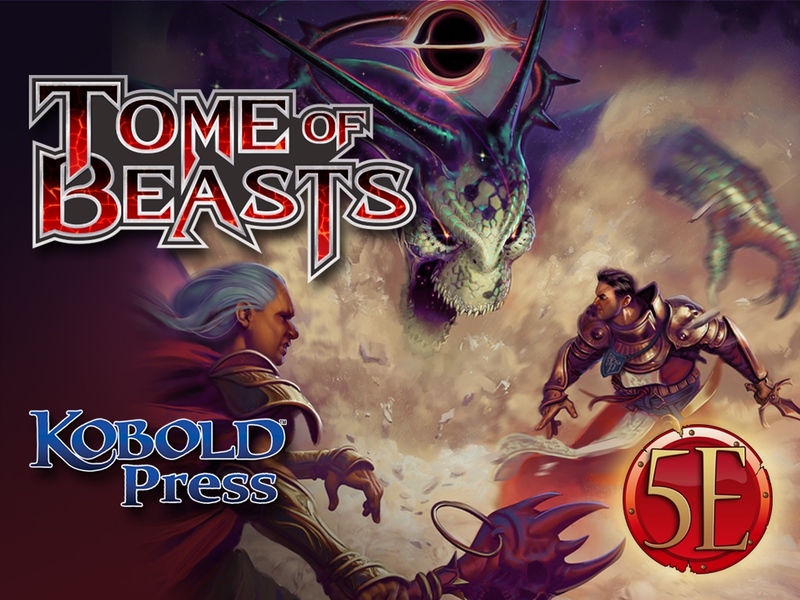 6 1 female desert giant Tome of Beasts Investigates any sounds of combat in areas 1-9. 7 1 male desert giant Tome of Beasts Stays in this room if trouble breaks out and continues eating. 8 1 corpse mound Tome of Beasts The corpse mound omes out of the pit and attacks when non-giants enter the room. 9 Calamed Zeif Tome of Beasts If Calamed hears combat in areas 6-9, he investigates and offers to parlay with the characters. 10 6 dust thirsters Tome of Beasts The dust thirsters rise and attack from the coffins when non-giants enter the room. 11 1 oozasis Tome of Beasts The oozasis attacks any creature that gets near one of the bowls and remains hidden until then. 12 1 female desert giant Tome of Beasts If combat breaks out in areas 10-14 the giant goes to investigate. 13 1 adult copper dragon Monster Manual The dragon is chained to the floor and has only 20 hit points remaining. 14A 1 female desert giant Tome of Beasts If combat breaks out in areas 10-14 the giant goes to investigate. 14B 1 male desert giant Tome of Beasts If combat breaks out in areas 10-14 the giant goes to investigate. 14C 1 female desert giant Tome of Beasts If combat breaks out in areas 10-14 the giant goes to investigate. 16 1 desert giant mummy Appendix B The mummy rises to attack when the trap in area 17 is triggered. 17 Ayla Zeif, 1 fire elemental Tome of Beasts, Monster Manual Ayla remains in this area and summons the elemental if attacked. 18 Erlin the Great Tome of Beasts The Jotun is imprisoned here. Quick announcement: The meaty World Builder Blog posts will now come every Thursday, since episodes of Have Spellbook, Will Travel drop on Wednesdays and I don’t want to overload you. Time for even more aberrations! In that post I showed off the Lovecraft-inspired moonbeast. Then in a later post I presented my hound of Tindalos and after that my gug. In this post I’m showing off my fifth edition Dungeons and Dragons version of the dimensional shambler! Dimensional shamblers are 5-foot tall hairless beasts of humanoid form. Tight grey and red skin binds their unnerving crouched form. Their hands sport cruel claws and their almost simian head can open terrifyingly wide to reveal rows of canine teeth. Very little is known about their motivations, but theories abound. Hunters of Intelligent Life. Dimensional shamblers cross the multiverse using their innate plane-shifting abilities looking for prey. While no one is certain what exactly attracts shamblers to a particular prey, they seem to be drawn to intelligent humanoids who use magic to travel to and summon creatures from other planes. While such victims appear to be a shambler’s preferred target, they are known to abduct any creature with above animal intelligence. A shambler can spend years tracking a single target. Soul-Devouring Torturers. While dimensional shamblers are powerful combatants and known to kill large groups of humanoids, they much prefer to drag off a single intelligent creature from a fight. They will carry these victims to forgotten corners of the multiverse and bathe them in a ooze-like substance called gray mire. The gray mire painfully devours and nourishes a victim over the course of weeks as the shambler watches, never resting. Eventually the victim’s body is completely destroyed by the mire, leaving only their soul which is devoured by the shambler. Power in Numbers. While dimensional shamblers often work alone, they do cross paths in the multiverse. Sometimes these horrors agree to work together to capture prey. A strange bond forms between shamblers who agree to work together, increasing each’s power exponentially. Aggressive Plane Shift. When the shambler casts plane shift any creatures it is grappling must succeed on a DC 17 Charisma saving throw or be teleported with the shambler. If the shambler is touching an unconscious creature when it casts this spell, that creature is automatically transported with the shambler. Hypnotic Presence. Creatures who start their turns within 30 feet of the shambler and can see the creature must succeed on a DC 17 Wisdom saving throw or become paralyzed for 1 minute. A paralyzed creature can repeat the saving throw at the end of each of its turns, ending the effect on itself on a success. If a creature’s saving throw is successful or the effect ends for it, the creature is immune to the shambler’s Hypnotic Presence (and the hypnotice presence of all dimensional shamblers) for the next 24 hours. Strength in Numbers. The DC of the shambler’s spells and Hypnotic Presence ability increases by 1 (to a maximum of 20) for every other dimensional shambler within 100 feet on the same plane. Multiattack. The shambler can make three attacks: two with its claws, and one with its bite. Bite. Melee Weapon Attack: +9 to hit, reach 5 ft., one target. Hit: 16 (2d10 + 5) piercing damage. Claws. Melee Weapon Attack: +9 to hit, reach 5 ft., one target. Hit: 12 (2d6 + 5) slashing damage and the target is grappled (escaped DC 17). Until this grapple ends, the target is restrained and the shambler can’t use its claws to attack another target. Create Gray Mire. The shambler touches any 10-foot-square area of natural ground such as dirt, stone, grass, sand, or ice and it becomes a 5-f00t-deep pool of gray mire. Creatures who enter or start their turns in the area must succeed on a DC 17 Constitution saving throw or become paralyzed for 24 hours. 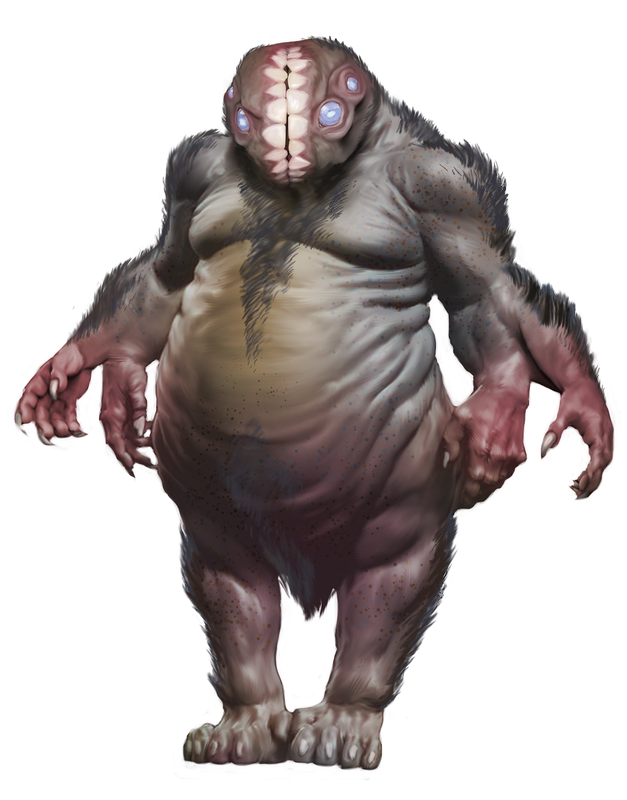 During this time the gray mire nourishes them, so they don’t need to eat, sleep, or breathe, but it also eats away at their flesh, dealing 1 necrotic damage which cannot be reduced in anyway. The target’s hit point maximum is reduced by an amount equal to the damage taken effect. This reduction lasts until the target finishes a long rest outside of a pool of gray mire. If a creature’s hit point maximum is reduced to 0 by this effect, it is consumed by the pool and any dimensional shamblers nearby regain 171 hit points. At the end of 24 hours of being paralyzed, the creature must succeed on another DC 17 Constitution saving throw or suffer the same effect if it still in the pool. The pool counts as difficult terrain. Creatures who start their turn in the pool or enter the pool on their turn must succeed on a DC 17 Strength saving throw or become grappled by the mire until the start of their next turn. A creature who is in the pool can be pulled out of it by another creature not in the pool who can reach the creature in the pool with a DC 17 Strength check made as an action. Being pulled from the pool ends any grappled or paralyzed condition caused by the mire. Dimensional shamblers are immune to the effects of the gray mire.